Danielle Imperial Captain of the Philippines. 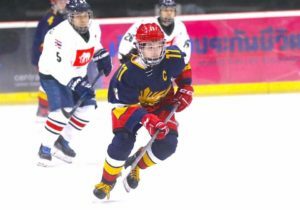 We had the great pleasure of interviewing Danielle Imperial the Captain of the Philippines Women’s National Team and how she grew up playing hockey on the driveway and in the garage, “Wow! does that sound familiar to us in North America and around the world”. Danielle started late playing the game, but never gave up the dream of one day representing her country at an international event. women’s national ice hockey team. 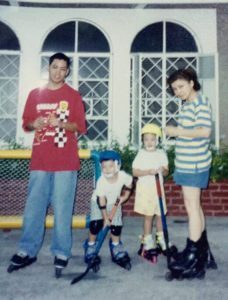 I started playing ice hockey when I was fourteen years old, I’ve only trained here in Manila since I started. Currently I am a university student on my fifth year, majoring in Economics with a minor in English Literature. How did you get involved in the game ice hockey? Ducks movies as soon as they moved back. My brother and I grew up routinely re-watching the movies then playing outside every afternoon during summer vacations. We started in our garage with plastic sticks, moved to our driveway when we got older with wooden sticks, I brought those to the ice rink later unaware they were outdated and that we needed composite sticks that were much lighter, haha. We stuck with those moving forward. Outside from yourself who do you credit for helping you learn the game of ice hockey? I’ll have to name quite a few actually but if I had to mention only one, it would be Carl Montano. I was lucky to have started playing ice hockey at the time Coach Carl had just moved back to Manila from Vancouver. He inspired a different kind of passion for hockey in so many of us youth players who all looked up to him. He was my coach for six out of the eight years that I’ve been playing, and has just recently been named head coach of the women’s national team. He knows me best and has always pushed me to be the player he believes I can be. Though other coaches I’ve played under have also inspired me in several ways to, getting to play for Coach Carl again is something special. This brings me to mentioning another person who has had so much to do with my development- my younger brother, Bj Imperial, who is actually an assistant coach for the women’s national team. He is multiple times the player I am and I’m lucky to have him coach me on the ice and off, even when I’m working out or shooting pucks at home. Watching him play on the men’s and u20 national teams is always special, and having him as my coach means as much. There are so many more people I would mention who have made me the player I am today— my cousins who introduced me to the sport, my hockey mom and dad who have supported us so much, the older boys who made me work harder every time they would yell at me on the ice when I made mistakes starting out, the expats in our local league who made sure I stepped up in every game, several close friends from more seasoned national teams who I continue to learn so much from (Lim Wenlin, Tracy Wong, Jana Kivell, Linda Liu, etc…), and of course my own teammates who inspire me to work to become the best I can be. Team. What was your reaction? When I found out I was going to be on the women’s national team, I was so excited for all the opportunities ahead of me. 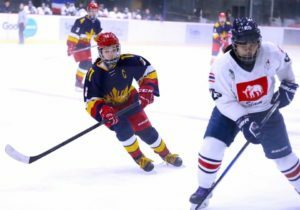 There weren’t many girls playing together in the Philippines but three others and I had already been dreaming of playing for our national team and competing in official tournaments before Hockey Philippines was even organized and recognized by the IIHF. I was eighteen years old when I was told I would be playing on the very first Philippine women’s ice hockey team and, on top of that privilege, being named captain. Playing for the women’s national team changed my drive, commitment and passion entirely. Today, three years later, I can say for sure that I had no idea how much of an impact this would make in my life. It has only been three years but I am very thankful for all the opportunities and experiences that have come my way, as well as those that have yet to come. What are some of your training methods? I try to get as much ice time as I can. academy development program that I try to make has much as I can. When I’m at home, I workout and do dry land training on my own or with my brother. more dryland training and workouts than I do on-ice sessions for training. I watch a lot of hockey online, women’s hockey in particular, I watch a lot of women’s hockey, and make it a point to take notes. Whether it’s of past Olympic or World Championship games, archived or livestream game videos from different divisions of the World Championships, I follow a lot of women’s hockey. I’ve recently been re-watching this year’s Olympic women’s hockey games and some of my own old game videos to see how I might apply what I learn to change my positioning or visualize what I could’ve done better. playing for Northeastern. So many leagues and players to follow and learn from! I’ve been reading a couple of books to develop the mental aspect of my game. I think the mental aspect of the game is a very important part of our development that is quite overlooked. As captain of the national team, it was easy for me to realize that my mental game was something I needed to develop as much the physical, not only for myself but also for my teammates who look to me to lead by example. After we competed in our second IIHF Women’s Challenge Cup of Asia last March, I started reading several books to develop my mental game. There are very wide gaps in age and skill among the few female players we have here in the Philippines, even within the national team, and this makes our development a bit tricky. But no, I don’t think any of us can play pro in North America just yet. Unlike in most other countries, specially those in the higher levels, none of us girls started skating at early ages. I started when I was fourteen and it’s the same story for most. Two players started at around the age of eight but that would be the earliest any of us started. At that time, they didn’t have the opportunities and training programs that players have now thanks to Hockey Philippines getting everyone organized and on the same page to really grow the game. There aren’t many young girls under the age of fifteen but most of the active players are within the ages of fifteen to twenty-five, with a few in their thirty’s and our goalie who is fifty years old. All our players right now are home-grown, with a few training overseas because they move for university. 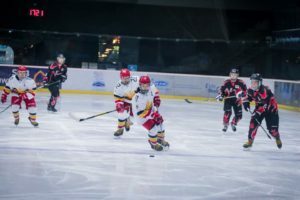 Given the ages and late introductions to the game, no one was really able to commit to the sport and dream big until four years ago when Hockey Philippines was founded and recognized by the IIHF. When that happened, everyone got on the same page and had a direction to work towards, we had goals and a more serious purpose to keep playing. 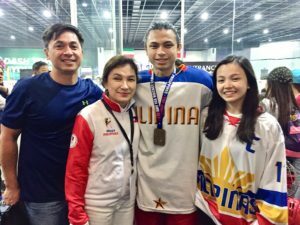 Now that Hockey Philippines is around and recognized by the IIHF, everyone has more to look forward to and work for in their hockey careers. I think that we’re only starting to realize and develop the potential of Philippine hockey. Even home-grown players have stood out well in international tournaments so I think that it will be exciting to see how we all continue taking strides moving forward. against the UAE team we had played against, and lost to twice, in a recreational tournament three years prior. I saw the team come together and find our stride as we took our baby steps as the first ever Philippine women’s national team. Half the players on the team were playing their first ever hockey games that week, while the rest of us were learning our first few lessons on being on an entirely different stage of hockey as national team players. the South East Asian Games? Unlike the Asian Winter Games, where they won a bronze medal earlier that year, the Southeast Asian Games is a big deal in the Philippines as it gets a lot more media coverage and public following. All of us knew that winning the tournament would mean making a name for ice hockey within the country and on the international stage as well. We got a lot of publicity and support from friends and family back home who stayed tuned to the games. It was also a surprise to see a couple of Filipinos working in Malaysia come out to watch and show their support. It was definitely a big win, and we were all very proud of the men’s team. Malaysia, the team that went on to win bronze. Our game against them ended in a shootout after they caught up to tie the game in the last few minutes. To add to the intensity of the game itself, the stadium was jam packed with Malaysian supporters on all three floors with maybe around fifty Philippine supporters in one corner cheering our heads off to compete with their crowd as soon as they’d tone down. What does the future hold for Danielle Imperial? and working with as much passion as I have been through the sport. Who are some of your favorite ice hockey players? Family picture with both my brother and I in our jerseys. Photo taken after the CCOA 2018 Men’s top division where they won bronze.